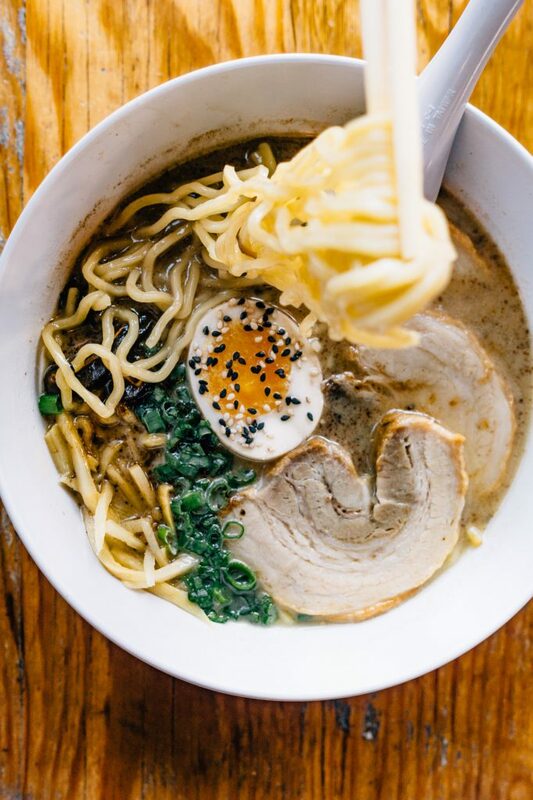 The hunt for Denver’s Best Ramen continues! 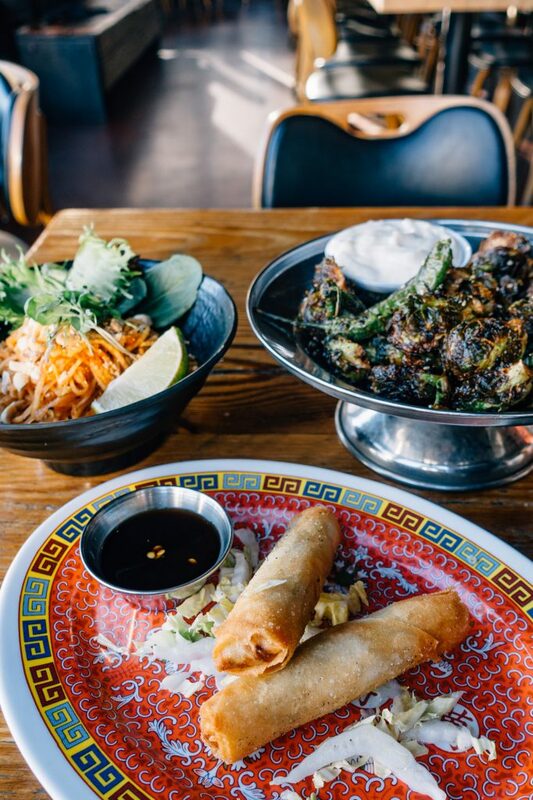 When I heard that Chef Thach Tran had taken over as head chef at Ace Eat Serve and the re-vamped menu included an Asian-inspired menu and ramen involved, I was looking forward to stopping in. 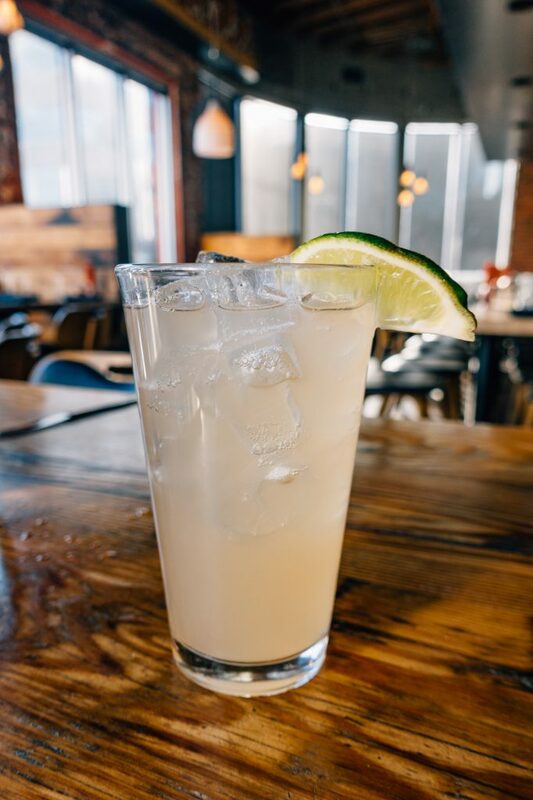 Then when I saw on the menu that there was an awesome happy hour deal where you could get a bowl of ramen plus a drink for $11, I knew I needed to run, not walk to check it out and file a report for y’all! Please note: Financial compensation was not received for this post. I was invited by the PR firm working with Ace Eat Serve to come in for a meal on the house. Opinions expressed here are my own. 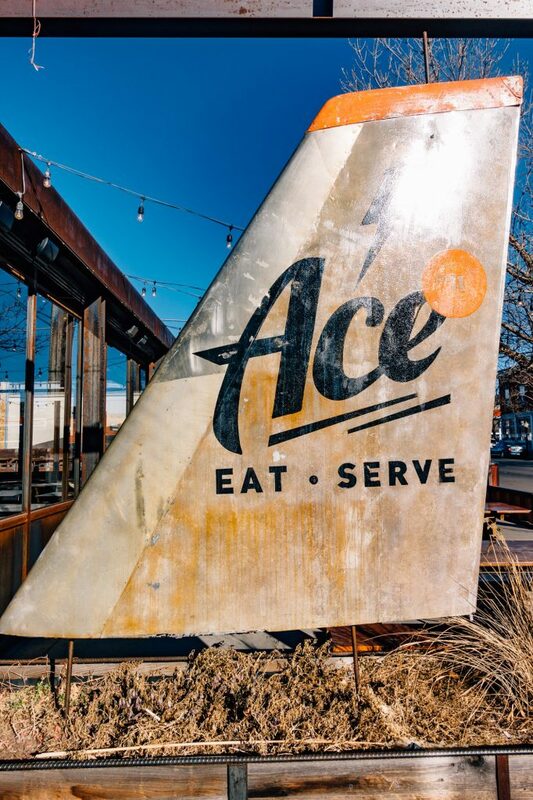 Ace Eat Serve’s North Cap Hill location is in an old converted garage space and is decorated with industrial-style repurposed and recycled materials. The first wink at this was the super cool restaurant sign outside made of an old tailplane. My husband is an airplane buff so he was chuffed to see this. 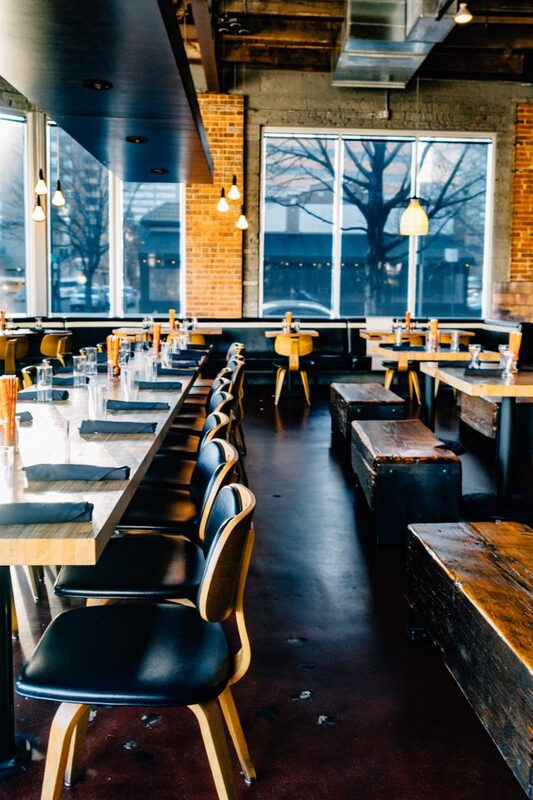 The dining room is a bright an open space, with benches made of reclaimed wood and a huge communal table in the middle of the space. It’s got that mid-century modern meets industrial feel to it – cool, but still comfortable. Since we got there right when it opened we were pretty much the only people in the restaurant so we took our time and ordered some nice nibbles off the happy hour and appetizer menu. First, drinks! As you may know, I don’t drink alcohol so I was very excited to see that Ace does their own housemade sodas. Our server recommended the Grapefruit Soda ($3.50), which was fantastic with some extra lime juice squeezed in. I’ve really come to love sodas and shrubs that are made on premises, and this was no exception. Just a delightfully bright and cheery drink for this teetotaler. 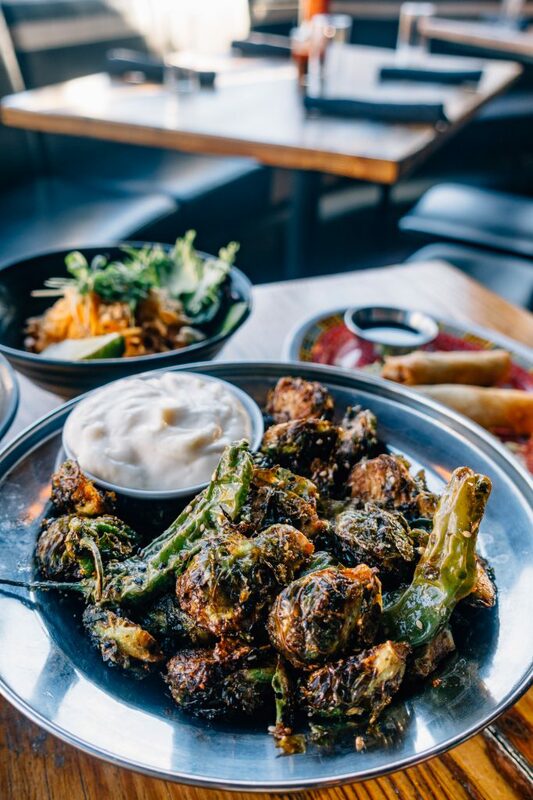 We started off with a huge plate of Brussel Sprouts & Shishitos ($9) that were tops. They were sprinkled with togarashi and sesame seeds and served with a lime aioli dipping sauce on the side. 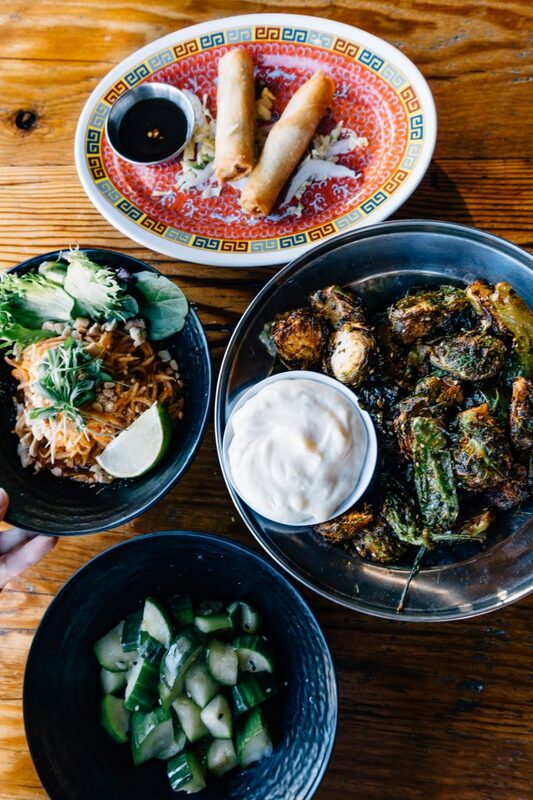 Lots of food and a great sharing dish. The Crispy Imperial Rolls were great too. Featuring a wheat wrapper stuffed with taro root, vegetables, and vermicelli noodles and served with a spicy soy sauce, they came two per order. A total steal at $3, normally $6! The extra salt and pepper on the outside of the rolls were a really nice touch and made them possibly the best seasoned crispy rolls I’ve had in a while. My husband loves sour things so he couldn’t resist ordering some items off the regular menu. We got the Pickled Cucumber Salad ($2 during happy hour, $4 regular menu), which comes with your choice of spice level. We decided to go with the recommended spice level, which I didn’t find too hot. Just added a nice extra kick. 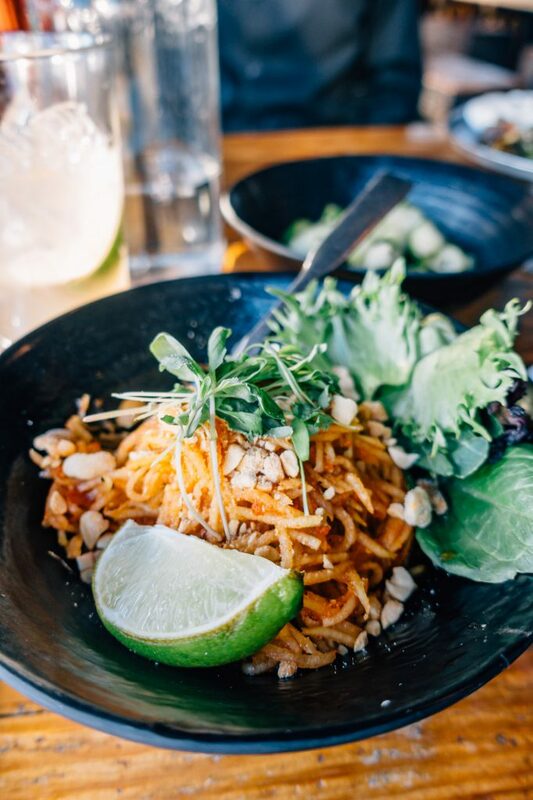 My husband also loves Green Papaya Salad ($7) so we ordered that off the regular menu as well. This papaya salad was much different than other versions I’ve had before. It came spicey as well. Then it was on to the main event – RAMEN! 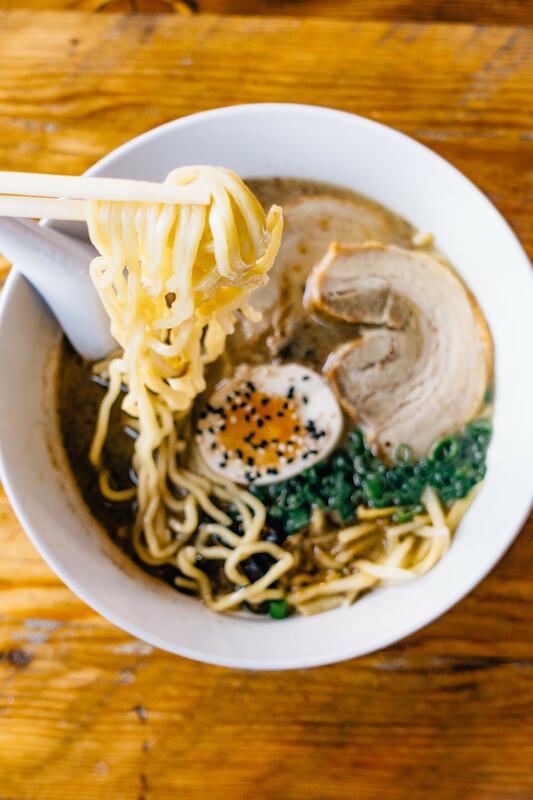 As I mentioned before the ramen and drink deal is $11, but if you just want ramen it’s only $7 for a bowl during happy hour (normal prices are $14-15). I went classic and got the Pork Belly Tonkotsu and my husband got the Miso Mushroom. I personally felt that the tonkotsu had deeper flavors than the miso version – possibly helped by the black garlic oil in the bowl. I did bring home the Miso Mushroom as leftovers and ate it the next day and enjoyed it more the next day! In the tonkotsu bowl the mushrooms were full of umami. Would have liked to have seen more greens or sprouts, less meat. Pieces were thick, and that gray/brown sort of color, but the meat was still tender and not chewy, so not bad. 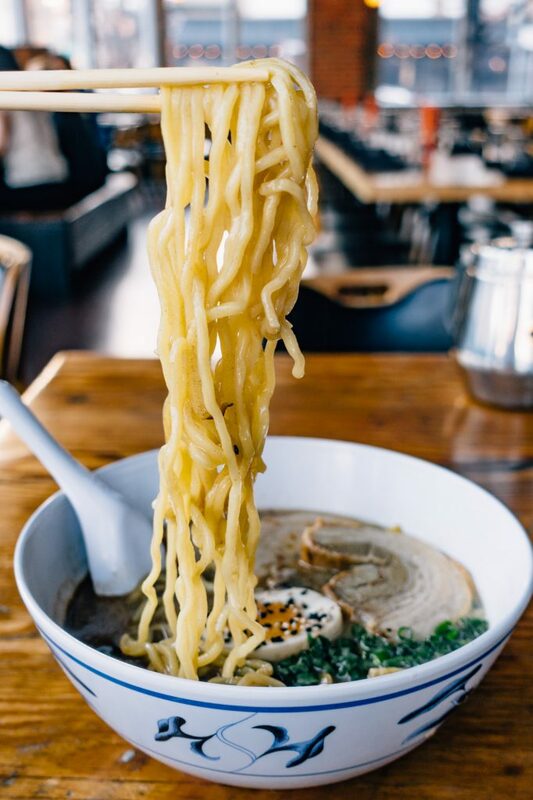 The noodles were the “wavy” ramen noodles that I see many places in Denver use. Compared to the many other bowls of ramen I’ve had in town, I think this runs in the middle of the pack. However, combined with the killer happy hour prices, I think Ace Eat Serve is an awesome place to get a cheap bowl of ramen and for meet up with friends and hanging out and I would recommend stopping by for that reason. Recommended: Anything off the happy hour menu! 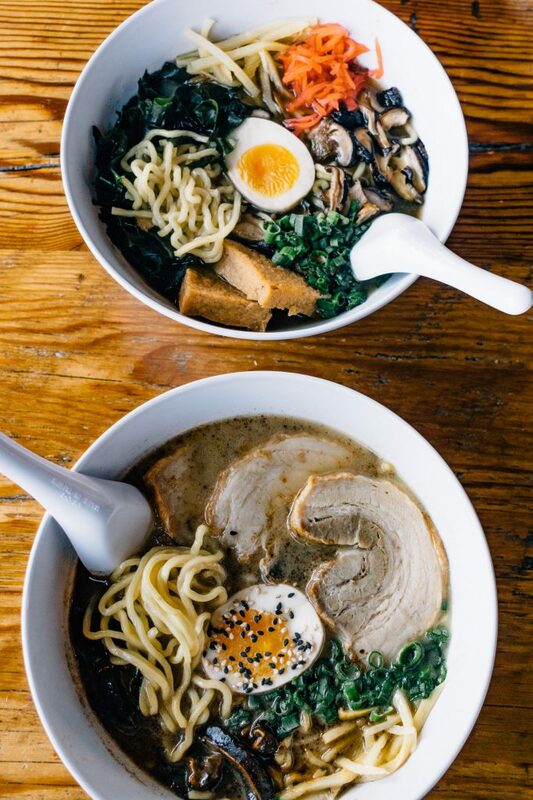 Have a recommendation for the next ramen joint in Denver I should try on my quest for the Best Ramen in Denver? Leave your picks in the comments!